The Smart Scientists That Could Finally Mean Your Dog Goes Where You Want It To Go. Humans have relied on the help of dogs for hundreds of years -- whether it\’s for hunting, assistance for the blind or just to keep us company. Now, researchers at Tohoku University have discovered yet another way to utilize our four-legged friends. They have figured out how to command a canine\’s attention and even direct its movements from a remote vantage point, using a light-emitting vest. In reality, the vest guides the dogs via flashlights, reports Andrew Liszewski at Gizmodo. In a recently posted video, researchers demonstrate the gadget. Essentially, the dog wears a vest with flashlights on either side. The lights can be aimed from afar, creating bright spots on the ground. The dog is then able to follow the lights around obstacles, which, in the cast of the lab demonstration, is a series of folding tables. The dog can pass the narrow space like a door and walkway and take a photo of target objects. 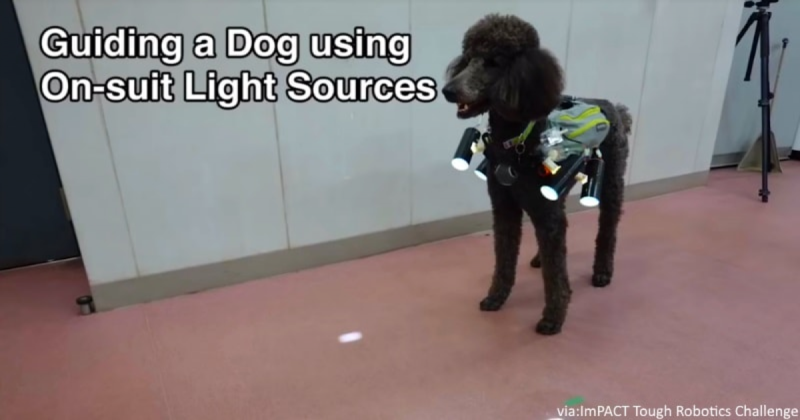 In this video by “ImPACT Tough Robotics Challenge” the dog is fitted with a vest that has ‘on-suit light sources,’ which shine on the ground in the direction it should go. Scientists are looking to put a new kind of dog into the fight to rescue survivors of future disasters: a canine strapped into a high-tech vest that will allow it to function somewhat like a robot. Don\’t forget to share this video with your friends and on Facebook.